Softros LAN Messenger, the LAN messaging application that enables safe, secure and effective intra-office communication is now available for Mac OS X. Thus, one of the most popular and used messaging apps for intra-office communication is now cross-platform and you can use it for messaging between Windows and Mac computers. Softros LAN Messenger now supports Macs (OS X 10.9 and OS X 10.10) which was maybe the only thing missing in this bellowed and critically acclaimed messenger. The messenger has all the features that are included in the Windows version. In short this app is secure, private, and most importantly serverless. Softros LAN Messenger now includes tons of features that will be available for the Mac users. First of all, the most important feature is the security and privacy, because the Softros LAN chat software encrypts all data with AES-256 and works strictly within your company network. It is easy to install and use. Any worker will use this messenger with easy because of the intuitive interface. The app can work on serverless architecture you do not need to set up and maintain a dedicated messaging server – our IM tool is a stand-alone peer-to-peer based application. Exchange messages with just one or multiple users at the same time. Group Messaging and offline messaging are both made possible with Softros LAN Messenger. The file transfer easily exchange documents with your colleagues. Just drag and drop a file or folder on the recipient's icon in the user list or on the conversation you are having with them. Some additional features of the messenger are that you can create groups of your co-workers, keep track of messages with saving them locally or to a network share. View, search through and print out your correspondence with other employees using the built-in History Viewer. Softros LAN Messenger is a great solution for any business and now it is available for business that use the MAC OC X. It can be of amazing help to any business, and now it works on two of the most used operating systems. From the University of Games there comes another exciting and ultra-interesting game based on the classic Windows game Solitaire. Designed in a lovely way, with a lot of attention put to detail and functionality, Kingof Solitaire will surely take the top place among the best solitaire games for Android very fast. Flawless, light, sharp, challenging and exciting are the 5 words that could describe this game the best. The game is tailored for any Android device, it will work perfectly on both your smartphones and tablets. Most importantly it will work both in landscape and portrait mode. Sharp, with nice graphical interface and pleasant music that will get in you the game and excite, King of Solitaire has modern looks and design but with the true spirit of this classic card game. If you are in search for new challenging solitaire, spider solitaire, free cell or similar patience card game, then stop because King of Solitaire is the perfect game for you. If you are a master of Solitaire Games then this could be your newest challenge. With the statistics feature, try to win your games as fast as you can with least moves. Try to keep the best possible winning percentage. Also, try to keep the average moves per game and average time per game at the lowest possible number. At the end always try to beat your best time! 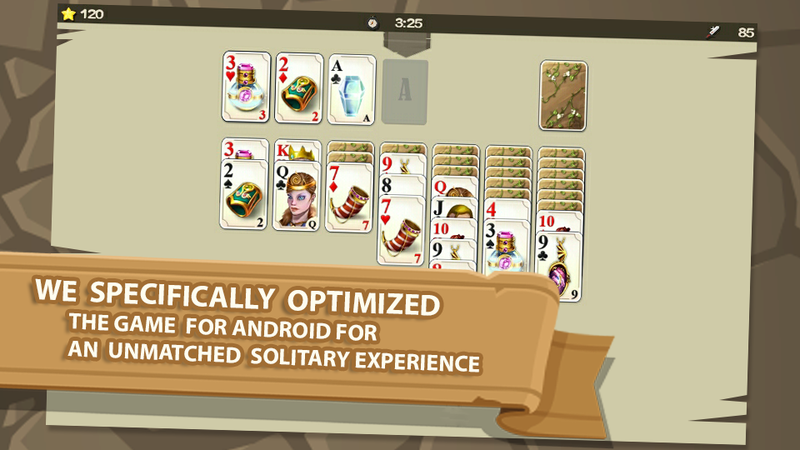 King of Solitaire is the new solitaire game that you need to try out. It will excite you, it will challenge you and at the end of the day it will entertain you. With this user friendly game you will only be relaxed and have fun. This is truly and unmatched solitary experience that is destined to achieve global success among Android users. The Smartphone Mall is a website where you can find anything about any smartphone. From cases to accessories and headphones, the smartphone mall is an amazing online shopping website that will offer you tons of quality products and great deals. Actually, after we used this website for the last 2 weeks we could easily say that it is one of the best online shops for smartphone accessories. So, lets see what this site has to offer. First of all we loved how the site is cleanly divided. It is clean, with minimalistic white background and no pop ads or confusing banners. Right from the top, or from the left side you can access the categories of the website. Each category loads up fast and shows relevant products. However, if you can’t find the thing you wanted in that particular category, then you can use the search feature and enter the desired keywords. After you select certain product there is great amount of information about it. There are various photos that show the product. You can zoom in and check it out in different angeles. The products description is also very precise and concise. Most of the products have 1 or 2 year warranty. Products from famous world brands are also sold on the smartphone mall, so be sure to browse through it smartly as you can definitely find quality and affordable products. At the bottom of each product, there are similar products that will also help you to get the best products. We have used the smartphone mall for the last 2 weeks and we are extremely satisfied with everything about this website. We have ordered several accessories for the smartphones in our office, and everything arrived as described and on time. The shopping experience we have at smartphone mall is one of the best we have ever experienced and we will keep coming back here. Amazing online shop for smartphone accessories. We all know that we could accidently delete photos from our devices, or we can damage our computers or cameras. In situations like that you will need highly functional software that will recover the deleted photos. One of the best, intended for Mac Users, is certainly the outstanding Disk Drill for Mac. Featured at the CNet’s download.com, Disk Drill is one of the best new system utilities and it has more than 120k downloads. This is a tool that will enable you to scan your computer and any other connected device for lost files that you have probably deleted accidently. After you install it you can use it on your computer if you need to recover file from your computer. If you need to recover files from your camera, USB or any other device you will need to connect it and scan it through the software. For the purpose of this review we have tested the software on our devices. The scan is fast, and the great thing is that there are two types of scans available. The Quick scan is recommended for recently deleted files, while the deep scan is useful when the file was deleted before a long period of time. We had great success and when compared to other software Disk Drill for Mac definitely found more files. It definitely uses genuine and more advanced technique to get and recover deleted files. Regarding the UI and the graphical interface we must say that it is also one of the best we have ever seen. Everything is nicely arranged and neatly organized. The software looks highly professional. At the end of the day, Disk Drill is a sophisticated software that can be of great help for you! It can save you from many unpleasant situations and get you even the photos that you thought you lost forever. Download it for free on CNet. Produced by the outstanding company MaxScholar which produces various educational software solutions, Max Words for Chrome is one of the best educational apps for this platform. The idea behind it is exceptional. It will enable you to learn all you need to know about Latin and Greek roots. The idea behind this app is that it wants to increase your vocabulary through various extensive reading and learning word parts, including roots. If someone is little confused about the meaning of the word “root” we will clear that right at the start. Root represents the basic portion of the word that carries a meaning. By learning what certain words mean, you will build and develop your vocabulary, and us most of the words in the English language have Latin or Greek roots, it is easy to say that the need for this app was obvious and we are sure that it will achieve big success. After you download and install it from the Chrome store right from the start you will hear nice, pleasant female voice that will lead you through the process. The voice will teach you the meaning of the roots and how they are used in different words. After that you can practice what you have learned by forming words, sentences, paragraphs and simply develop fluency. Each root has different modules, and each module has sets. You can go back and forth through the sets and repeat some things for better learning. The exercises are extremely helpful and you will definitely learn fast using them. Each set contain various words and roots that first are nicely read and explained to you. You will progress fast and get things quickly as the method of learning is amazing. Also, the UI and functionality of this app are basically flawless. It is easy to say that this guys are professionals when it comes to both content and design. Max Words has great features, it is perfectly designed, with outstanding content and learning methods and it is definitely worth downloading. You can gain great benefits from it for free. This is a great app for kids and people that have just started reading and going to school. Get it for free on the Chrome Web Store. American Mafia is a great new free iOS game which was released 5 days ago. This lovely game needs to get the deserved attention as it is certainly one of the best new games released this month. The story line is very interesting. You are in the 1930’s and the mafia is ruling the city. You are trying to escape from being a gangster, but that is extremely hard job. 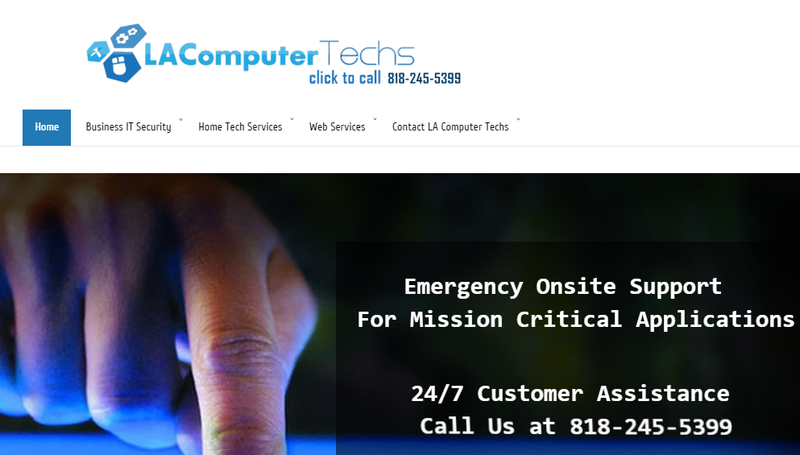 LA Computer Techs is a business that offers such IT support help. They offer business IT security services, web services and home tech services.They are the company you need to call if you have any IT problem and need computer repair or fixing. Anyone running a company, whether it is small, medium sized or big company, knows that an IT technician is crucial for their existence. However, many could not afford the proper IT technicians and they go for amateurs that kind off know about computers. After the real problems occur the owners are often left stunned and need an IT professional that can help to solve their problems very fast and for a very affordable rate. This is where you will need the services LA Computer Techs. Their business services are amazing. Basically you can hire them for any problems regarding IT management or support consulting, repair of office computer, network support, printer installation, remote computer monitoring or pricing structure and retainer services. When it comes to home computers they can do data backup and recovery, which can help you in situations when you need safety on your own files and folders or in situations where somehow you have deleted your files. Also, they can setup your home network or repair your computer for any damage. Additionally, they offer website design and development, local SEO, or even spyware and virus removal. They have amazing customer support and they work 24/7. Talking to them for the purpose of this article they assured me that they have flat rate (150$) for repairing any problem via remote desktop assistance. The great thing is that they will return your money if they don’t solve the problem! So, it is easy to see that these guys are amazing, experienced IT professionals that can help you in any computer problem for extremely affordable rates. Write or call them anytime as they have 24/7 customer assistance. Many people have lost their files, identities, money and much more due to insecurity, hardware damages and mall practices or even hacker attacks. In order to take security to another level, the UK based company called Anenigma has produced one of the best software solutions to improve security. The product called The Desktop Safe and it can vastly and importantly improve the security of your personal files and folders! This software uses triple-pronged protection upon your files and private data that you store in a virtual safe. In that way you will never bullied or harassed by unwanted hacker attacks. You can get the Destkop Safe here. This file security software app will secure and hide your folers, apps, photos and documents. After you install it, the software will recognize all of the files on your computer. From then on you can put any file in a safe. You can do it in a simple drag and drop manner. Lets say after a while you create a folder that you want to securely store in the safe and protect it. All you need to do is to click “Encrypt”. Then your personal files are protected with the world class security tool that employs AxCrypt AES-standard. Your files will never be hacked. Additionally, you can decrypt your files at any time. 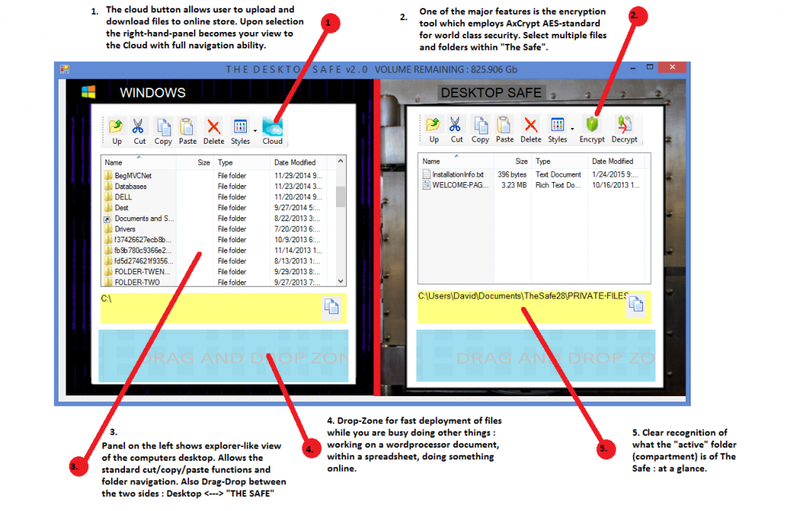 Desktop Safe enables Time Lock, which will lock your files for a certain period of time. On top of that you can store any of your personal folders or files on the cloud with a simple click from within Desktop Safe. You will have a free, secure portal online on which you can upload or access files and again with the AES security. From technical aspect, the app is very simple and easy to use. The UI is intuitive so you will start using the software in no time. We have tested the software for the last week and we can guarantee that it is amazing. It is extremely fast, you can encrypt or decrypt files or folders and upload them to the cloud in amazing speed. The best thing is that you can try the Desktop Safe for free and see if it satisfies your needs. However, we are sure that it will because it is truly one of the best file security software available on the Internet. PosterVents is a brand new event app for iPhone that was released few days ago on iTunes. This is definitely something fresh and unique in the entertainment category. The app will display you relevant posters from events that are near your location. Basically, it can display you events from any location in the United States, so, this could be your biggest friend if you travel in a city that is unfamiliar. This event app for iPhone could really help you in finding local community events or even national conventions in a really unique and compelling way. Actually, this iPhone event app includes tons of different event categories. From Arts & Entertainment, to Nightlife and Lessons/Classes, you can really find some entertaining and useful events using PosterVents. You can search through the events with a simple tap. The app will show you events within 50 miles of your location. On top of that there calendar search, which means that you can search for events on the days you are free. The City Search feature will also enable you to search events by city or location, which is ideal in cases when you are traveling to a city that you have never visited before. Additionally, you can easily search through events, with keywords or even with zip codes. This lovely local event app for iPhone will also enable you to add your own events. That means that you can add poster for your event in any of the existing categories and get extra visitors. PosterVents is totally free, which is another huge plus for promotion. All you need to is to snap a picture from within the app and that is it. So the app contains beautiful event posters, events near you and you can definitely use it for promotion of your own events. All these features are making PosterVents a high quality event app for iPhone and for the iOS platform. Get it for free on the App Store. Good Point of Sale (POS) solution for the Android platform are pretty rare. Rista POS is the new app for the Android platform that can fulfill the needs of your business. The app is so comprehensive and full of features that I’m sure you will find it very useful. Rista POS is extremely easy to setup. It basically requires no previous knowledge of POS software. It is easy to use and it has perfectly designed intuitive UI. You can create 3 system access controls: Manager, Admin and User. With Rista you can easily customize your taxes and attach them to your store or stores. The payments also can be easily set up and the sales can be followed flawlessly. On top of that you can create custom payments like vouchers, check etc. You can manage your orders in various ways. Most importantly the app enables you to share any order in real-time with the customers. Rista will also enable you to create catalogs. Actually the creation of catalogs have never been easier. You can define names, photos, price, add charges, discounts and organize them with categories. Rista POS is also Inventory manager. Whether you want to create inventory for each branch, or track each stock, the app will enable you great inventory management features. It is the same when it comes to Analytics. Your sales, can be analyzed in various manners and you can use that data in order to improve them and see where you are going well or bad. On top of all that features the app enables you to create digital receipts with logo and messages. This digital receipts can be sent by email, SMS, or by your Rista account. You can easily print this receipts on most of the printers. With all this flawless features, Rista POS can be used in most of the business. Be sure to try it, you will be thankful for the creation of such a powerful POS app. Dot Shot is a new addicting iOS game that will probably achieve huge success. The simplicity, easy to play, but extremely challenging, gameplay is the greatest advantage of this game over the other similar space invaders games. With simple words, Dot Shot – Aim and Shoot is a shooting game. You just need to aim your plane and shoot. However, when shooting you need to shoot the red dots and avoid the blue dots. The game gets harder as you progress. However, Dot Shot is not some kind of frustrating game. It is one of those pleasant game that will give you joy while playing. It is one of those game that will also relax you while playing. Because of the challenging game play, you will have hard time turning it off. Even more because Dot Shot is integrated with the Game Center. You can compete with other players of the game and fight for the first spot on the leaderboards. When it comes to technical aspects of the game the sounds effects, graphics and the plane are nicely designed and just retro and lovely. Dot Shot is game for all ages and it can quickly become one of your favorite games for iOS. It is available for both iPhone and iPad if you have iOS 8.0 or later. Get it for free on the App Store. Are you a League of Legends player? Do you love this popular game and like to get better? Do you want to improve yourself as a player? Well the service and website that we are going to present you today can largely help you in doing so. Lol Runners will enable you amazing LoL replay analysis and provide you with indepth analysis of your game session. The service collaborates with experienced League of Legends analysts and acquires them for video analysis. First of all you need to upload your OP.GG replay. Be sure that you clearly know what you want from the analysts. So, include video that describes your game and your weaknesses in the best possible way. For better results also include notes or requests that you want to be include in the analysis and the report. After that the professional League of Legends analysts will review your replay. You will get detailed report about your replay. You must record your replay in the OP.GG replay method. Check out how to do that here. We have tested their services for the purpose of this review. Recording a replay with the OP.GG method is very easy. After that we ordered their services. We got the full report in 36 hours. We must say that we are surprised on how well the analysis is written. You will get chills while reading for your own game play. But also, you will get informed and see your flaws. The analysts obviously saw some things that we would’ve never seen. On top of that he gave us great adviсes on how to improve our game. Every LoL player could have great benefit of the analysis enabled by LoL Runners. Their customer support is also amazing and there is money refund guarantee if you don’t like their services. What more can you ask for? The new Services allow app publisher to earn more from apps , Xcopy Inc. open new market for him with new way for payment. Our story began whom a good place to think of a good way in which Developers can earn and users can pay Fair price. So we started our journey to develop the product to create the perfect model that allows everyone to earn and pay fair. Xcopy Inc. allows any mobile App To Run as SaaS model price in Simply stated Instead of buying to rent. If you are into affiliate marketing, or you are selling products online, you must know that the traffic on your website is the most important aspect in your working. Knowing what the visitors open, buy, and stay on the website or their engagement can largely improve your sales. Clickognize is an excellent web application that will show you exactly what your visitors are doing on your website. The parameters it can show you are really incredible. First of all we got to inform you that Clickognize works with all famous website platforms and CMS, including: Wordpress, Drupal, Joomla etc. In order to start using it you just need to install the tracking code at the closing body tag. The process of installation was super easy and we installed it extremely fast on our Joomla hosted website. After the installation we started using it for one small selling website. Bellow we will inform you what information you can get with Clickognize. Remember that it is a service that enables amazing real-time visitor recording and heat maps of yourvisitors. - Firstly it will inform you about what keywords, refer links, tweets, languages etc. are driving traffic to your website. But, the best thing is that you can compare this through various periods and compare statistic very fast! - On top of that, not only that you can see where the visitors are coming from, you can also follow his activity in detail. Clicognize will enable you to follow his activity like no other app before. You will get real time information about what part of the page they like, and if there are some blockages that are preventing and decreasing the sales on your websites. - The real time recording of the visitor's activity is another incredible feature. Clickognize will enable you to record every user session from which you can see how he behave and how they are interacting with your site. - Clickognize also features incredible User Heat Maps of your website. Through this heat maps you will see user behavior & conversion optimization. You can surely use them for creation of better user-experience. As expected when you know what people click on your website, you will be able to do much better and effective changes that will eventually improve your sales and user engagement. The Heat Maps are actually one of the best features of Clickognize. There are several types of maps including by click, eye-tracking and by scroll. - The quality and variable Page Analytics is another great feature. It gives indepth information about every visitor. There are information about visitor’s country, length of visit, popular pages, total visitors, sessions etc. - Clickognize is mobile friendly and optimized. It will enable you to follow the information about your websites on any mobile device. If there is an ideal tool for internet marketers, then Clickognize is definitely that tool! Amazing set of features that can improve your sales, engagement and improve your site in so many aspects. It is easy to install and very easy to use. The UI and the organization of the tools is great. Everything runs smooth and fast. We doubt that you can find better web application and tool for following the behavior of your website’s visitors. Net Over Net is a software that enables you to create virtual private networks. The service it provides is simple, and yet it can be so much useful for you or your business. After you create your own virtual private network and connect certain devices (computers or mobile devices) you can access those devices from anywhere in the world. Lets see how to use it and how was our overall experience with this wonderful service. When you set up an internet connection at your office or home you get either dynamic or static IP from your ISP provider. Your IP is public and you can’t access your computer from other places through it. Net Over Net solves that with creating a virtual private network on their servers, and thus it enables you to control your computer over the Internet. Well, not only your computer, but also your mobile devices. That will enable you to open certain files, apps and do operations at your home, even though you are miles away from your home. First you need to register and sign up on their website. Then after you login you will be able to create a virtual private network and add your own devices to it via the web app. Then you need to install the client app to all of the devices that you want to control. For desktop computers you need to install the client app and install Tight VNC. Tight VNC will serve you as a free tool that supports one connection to a remote desktop. Additionally you can just enable Windows® Remote Desktop Services (RDP). From then on you can start controlling your computer, keyboard or mouse and work on your documents from anywhere in the world. We have tested it and we have experienced no problems whatsoever, the stability is exceptionally good. When it comes to mobile devices you must have installed a remote desktop app on your devices. But, the most important thing in setting up an remote desktop connection is to connect all device to NetOverNet. It is very simple. You just need to enter the address of the NetOverNet server, then your login info and the password in the VPN connection settings. We have tried to connect to NetOverNet through laptop, iPad Air and Galaxy Note 4 and it worked perfectly on all devices. The speed was incredibly good as well. At the end of the day we will keep NetOverNet and continue to use it for our future needs as we travel frequently. The setup is very easy, the possibility to add multiple devices is great and the stability is exceptionally good. The fact that it offers web and desktop apps is another great plus for this service. During the test of its services, from beginning till the end of this review, we haven’t experienced any problems. We installed the client apps on 3 devices, set up our devices, installed the client apps and used the devices from other computer located in another are in our city. Try it for free for unlimited time on NetOverNet’s website. The most useful software for this month is definitely the outstanding video download and converter software called Videzilla. In few words, this software will enable you to download videos from basically any site from the Internet. You can use it for your own website or to start your own business. Initially designed for moms to record those moments when her baby watches cartoons on the mobile device. The reactions of the baby, those smiles, giggles, funny looks can easily be captured, stored and even edited for future share on social media. “We are certain that everybody will find it’s own way to use RECreACTION. For example we are sure, that musicians will love it, because you can simply record your voice while the music is played in you mobile device. We truly believe many other uses will be found by people around the world.” - says developer of the app. Easy to use APP that consists of 3 simple buttons. With only on tap you can easily activate the recording of the frontal camera, you then choose the video you want to watch or want to show this video to someone to watch. And guess what? The app records the facial reactions and voice of the person who is watching this video now. The only important note to remember is to have correct direction of the frontal camera to the face of the viewer so you can capture it all. Later you can easily edit the video, take a snapshot from it, and easily share it on social media. Soon to be available at Apple Store. Many people in the business world are tired of Power Point. It is a common thought that PowerPoint can’t satisfy the advanced need of presentation. Everything is just the same, it lacks advanced features and 90% of the presentations are similar. You can’t be unique or have touching or meaningful presentation with most of the presentation software that is available at the moment. Garagua photo challenges. Original ideas that bring joy, happiness and optimism in your everyday life! Playing this photo/video challenges will give you amazing ideas how to have fun when you are bored, need to express yourself or want to spend interesting, exciting and unforgettable moments with your family, friends, kids and even strangers. Share how you complete those challenges and get a lot of likes and comments from everybody. Garagua challenges you to open the family album and take a photo of your first picture ever, to put on different socks for a day or to make a poster for your next birthday. Meet those challenges and many more, and have lots of fun while doing it. Garagua brings back the long lost ‘social’ in social networking. Someone said all the magic happens when we leave our comfort zone. You will achieve that in a friendly and fun way with Garagua. It is interactive, it is dynamic, and it is social. Garagua supports iOS 6 and higher. Bingo Bash is the new app that can let you enjoy playing in the most exotic bingo rooms of all time. Once you download the game and get started with it, you will join 4 million players in a single platform across the globe. You will have more than 350 levels to play and 50 ways to play with the pleasure of having new rooms added to the game after every 2 weeks. The wheel of fortune bingo is the brand new room there in the game. The worlds #1 game was formed when the #1 American game show and the #1 American bingo game collaborated and formed a partnership. In the wheel of fortune bingo, you will get to enjoy playing with massive bonuses. It will be like you ware walking on the Wheel of Fortune to play the best bingo of the world here. As you will start playing, you are going to unlock plenty of exciting bingo rooms to play in like Pot of Gold, Purrfect Crime and Wild West. It will be like you are enjoying real time bingo as you don’t just get to play, you can also chat with friends. You can also team up for scoring bonuses. You will get huge power ups, gems, chips and other exciting collectibles that are going to make the game even more exciting. It is not just bingo that you are going to enjoy, there are plenty of slot games which you can enjoy playing too. It is a multi-player game in which you can enjoy playing bingo real time just like you used to play with friends. You simply have to download this free game from Google Play and the simple interface of the game can make you enjoy it to your best. What could be a better way to play bingo? You can free download Bingo Bash Android games from Play Store here.